Self-archiving must comply with the provisions of Intellectual Property rules and legislation. If the publication has several authors, the contributor must obtain consent from all authors. 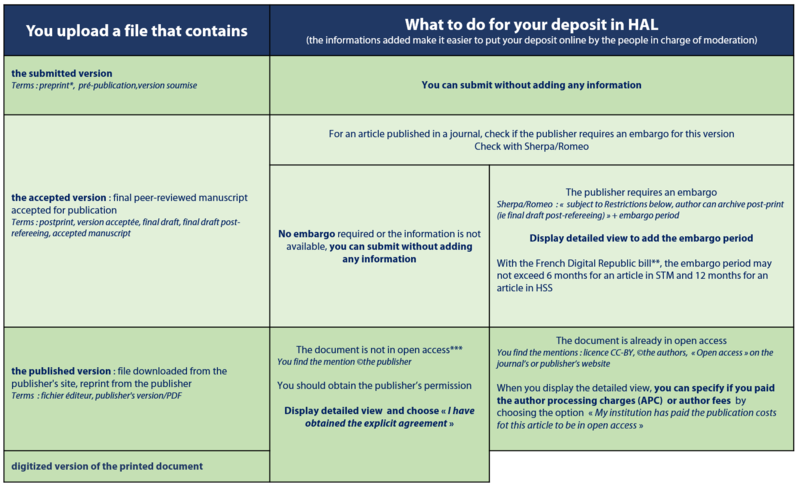 If the deposit is a published article, the contributor must obtain the publisher’s authorization or check the publisher’s policy if it is made public. Copyright issues cover the published document, but also any of its illustrations (photographs, images, maps, etc.). He/she understand that HAL reserves the right to reclassify or discard any deposit. *** If you downloaded the file from the publisher’s site without paying for it, you can probably do it with the licenses funded by your institute or library (eg recognition of the IP number). This does not mean that the article is freely available.